GOAL: Fundraising to hire an organizing coordinator for the Flint Rising coalition. GOAL: To stop the deportation of Catalino Guerrero by mobilizing broad-based public support and the engagement of his elected officials. GOAL: Provide fair second chances for returning citizens by banning the 'formerly incarcerated check box on federal job applications. 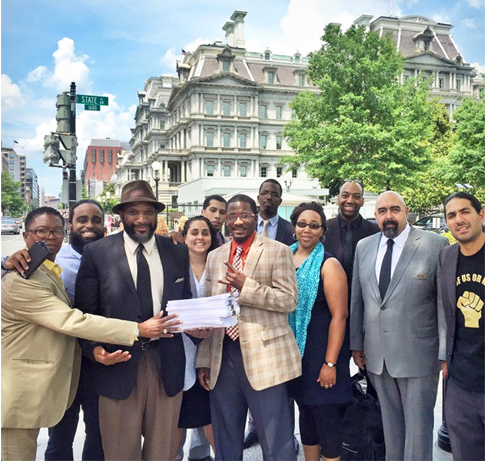 SCOPE OF WORK: A digital campaign of 5 emails - centering the voices (written, photo, video) of formerly incarcerated organizers and clergy - paired with social media calling for signatures and for participants to send their photos with us to the White House, telling President Obama how banning the box would change life for them and the people they love. GOAL: To stop the Trump's budget additions for ICE and Border Patrol agents, detention beds, and building of a border wall by driving calls to elected officials. SCOPE OF WORK: Multi media (interviews, graphics and production), walked with the pilgrims to document their work, national email campaign, and social media targeting elected officials. GOAL: End-of-year donor report to procure more funding / Inspirational recruitment tool for People's Action chapters not yet doing climate work. GOAL: To amplify realities on the ground of police brutality and community struggle after the death of Michael Brown. PSA: Images and videos included in Ferguson PSA for BET and Amnesty Intl. GOAL: Countering the hopelessness of ongoing police brutality and the debilitating policies of this current Administration with a message of hope and unified call to resist.